I Did It All For The Cookie: Trick or Treat? I Choose Treat! ﻿It's that time of year again when the ghosts and ghouls come out to play... and fans of baking can get creative with their creations! Add your own personal touch to parties this fiendishly festive season. Grab some food colours; pumpkin orange, midnight black, gooey green, putrid purple, blood red and just go for it! Look out for any sprinkles or candy to enhance your magical, scary baked goods. I found some Haribo gummy ghosts and a "monster mix", but there are so many variations out there now. I was at a party on Saturday (in my finest Dorothy Gale costume) and brought along some cupcakes and a haunted house cupcake stand I found in Lakeland. The cupcakes were just plain vanilla, but I used my Americolor gels to colour the cake. I divided it into 3 separate bowls and coloured one third orange, one third purple and the last third green. After they were baked I topped them with contrasting coloured vanilla frosting (orange cupackes with green frosting, purple with orange and green with purple). The frosting was coloured with my Americolor Electric gels which added to the eery Halloween look. Topped with some gummy ghosts and bats. ﻿Then yesterday my mother asked me to bake a cake for the family Halloween get together. 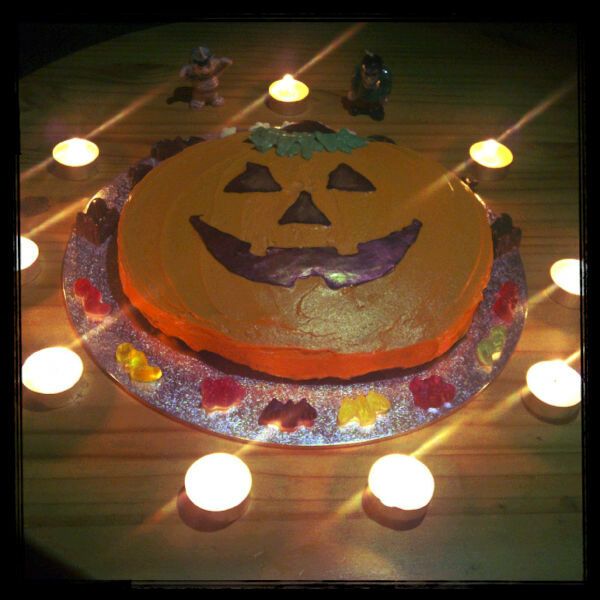 She had a Jack-O-Lantern cake tin, so I went to it and decorated it for her too. I used my Americolor gels again to colour the vanilla buttercream (best investment I ever made). To finish it off I melted some dark chocolate and used the cake tin to trace the eyes, nose, mouth and stalk of the pumpkin then used my leaf nozzle to pipe on some green frosting at the top. I also used my red and gold lustre dusts to colour the chocolate eyes, nose and mouth to give a candle effect. 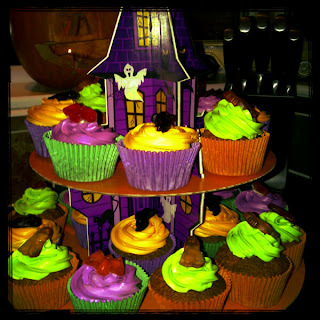 Hope these ideas help you to create some ghoulishly delicious treats. Happy Halloween everyone!